This recipe comes from my friend Cathy. She was very influential in my desire to try new recipes (she always had such great ones). Some of her other gems include Whole Wheat Muffins, Sweet Potato Casserole, and Almond Chocolate Kiss Cookies. This is a great pasta salad that can be served warm or cold. Heat 1 Tbsp. oil from jar of tomatoes in a skillet over med-high heat. Cook chicken until browned and cooked through; set chicken aside on a plate. In same skillet add pesto sauce mix with water and olive oil and bring to a boil; reduce heat and simmer for 5 minutes, stirring occasionally. Meanwhile, chop 1/2 the jar of tomatoes. 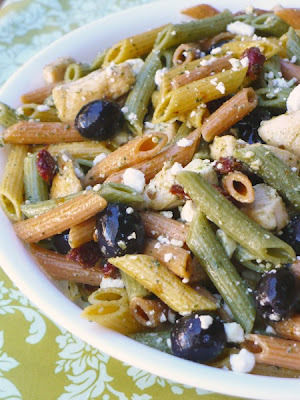 In a large bowl, toss together pasta, chicken, tomatoes, olives, sauce, and feta cheese. Serve warm or cold.